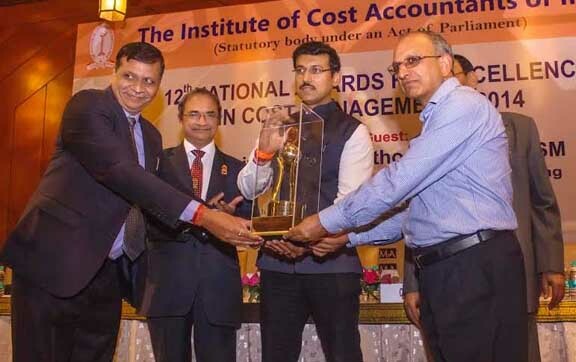 New Delhi : RailTel Corporation of India Ltd. has added yet another jewel in its crown by bagging the 12th National Awards for Excellence in Cost management 2014. This award is organized by The Institute of Cost Accounts of India. RailTel has won the award in the category of Public- Service Sector (Medium). A jury of eminent personalities led by Justice V.N. Khare conferred RailTel the first place in the Public- Service Sector (Medium).National Awards for Excellence in Cost management is an initiative to promote practice of Cost management and recognizing outstanding contributions of Finance fraternity. Col Rajyavardhan Singh Rathore AVSM, Minister of State for Information & Broadcasting presented the award to RailTel in an august gathering at Hotel Ashok, New Delhi on 15th July 2015.